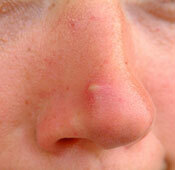 Some use full tips to reduce acne by using these tips you cane reduce acne. Wash face with mixture of Multani Mitti and Rose Water twice a day. Wash your face with a soap containing Glycerin. Chinese herb Srtawgliss can help curing disease. Use water base skin care products. large pores on face can be treated with paste of Sandal Wood (Chandan) and Black Gram (daal masoor) with Rose water. apply it for over night and wash in morning. Rub ice cubes for 10-15 minutes on your face. Cut Tomato and rub it's slice on your face and leave it for 15 minutes and wash with water. Rub fresh Garlic on and around acne. Pimple will dis appear like a magic. Mix sandal wood powder with rose water an leave it for over night and wash with cold water in morning. If you are having acne use some herbs in which Red Sandal (Chandan), Hina Leaves Fresh (Berg-e-Hina), Jujube (Inab), Mandi Booti (you can buy it from a herb shop) in equal quantity and grind to make powder.Soak 1 tsp over night in 1 glass boiled Water, drink 1/2 glass in morning and 1/2 glass in evening. After following one of these remedies u can have an acne free skin.